Trump Administration: First Hundred Days and Beyond. Re: Trump Administration: First Hundred Days and Beyond. Lol.jflem seal team six had a trans person for years .your bigoted claims are based in ignorance and intolerance . Dear god. And u r cheering this ? This is gonna cost lives. Not to mention be very unsafe . You do know that sensationalizing without cause and directing other's attention to these types of matters is much more damaging than just letting it be left alone? Over-dramatising headlines is much more demoralising and damaging to the ones that you feel a need protect. By continually bringing up these obscure, one-of's, is causing more harm, attention, and is counter productive to those that are directly affected. Just get off your SJW high horse, you are hurting people for no other reason but to draw attention to yourself. Just STOP it. Trump unfit to clean toilets. Trump is accepting the outcome but why isn't the Roy Moore team? Are they going the way of Third World countries where no one in power had to concede defeat? This is the way of dictatorships, not democracy, right? To nasty for even trump ? Do you like internet neutrality? Obama did. But not the Trump administration. FCC rules guaranteeing internet neutrality were ended today. I wonder if the whole sexual allegation stories were just side shows to take away from what is really happening to the entire United States? The end of 'net neutrality truly will affect everyone. The FCC chairman even admitted that he was in telecoms pocket lol. The changes aren’t even partisan though. There are a lot of republicans who are against it. Primarily because the overwhelming majority of Americans are against it too. People are starting to fatigue against the issue. It’s like every 2 years they try to push these changes through, and the telecoms and fcc just keep trying until people get tired of protesting and give up. Interesting article in the New York Times today, re Trump's inability to tell the truth: https://www.nytimes.com/interactive/2017/12/14/opinion/sunday/trump-lies-obama-who-is-worse.html. "In his first 10 months in office, he has told 103 separate untruths, many of them repeatedly. Obama told 18 over his entire eight-year tenure. 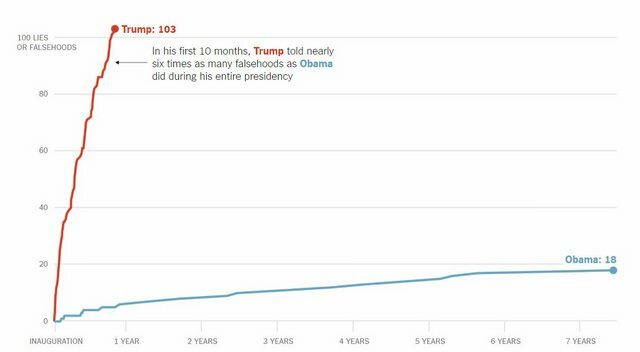 That’s an average of about two a year for Obama and about 124 a year for Trump." For some light reading, there is a complete, up-to-date list of all Trump's lies available in the article (and Obama's). "Politics is the gentle art of getting votes from the poor and campaign funds from the rich by promising to protect each from the other."